Torrey House Press, 9781937226350, 290pp. 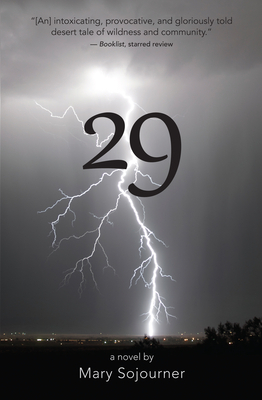 "Sojourner's writing is evocative, descriptive and lyrical...29 is a tantalizing read." "Sojourner seduces readers with shimmering visions of the West...At the same time, she forces us to face the weary but undeniable truth that we're butchering the place...Her palpable sorrow about the land permeates the novel, but it's relieved by a sense of humor and plenty of wisecracking dialogue." "Sojourner's book crackles and bristles with all of the right tones. The author lived in Twentynine Palms and in the surrounding area, witnessing directly the work of tribes to stop the spread of solar-power installations and the invisibility that many native peoples endure. Her book sings with authenticity." "Like the leafy sea dragon that moves gracefully in and out of these pages, 29 by Mary Sojourner is equal parts real and ethereal and wholly entrancing." " Sojourner] writes herself onto the page and bares all. Her characters personify past lovers and old friends, but ever apparent is the character of place." ..".wry, surreal, and tender...29 reminded me that literature is an ecstatic conversation between reader and author..."
"Ever-ascending Sojourner cooks up wrenching sorrow and hilarious banter, environmental and moral conundrums, magnetizing characters, and a place of transcendent beauty in this intoxicating, provocative, and gloriously told desert tale of wildness and community, unexpected bonds and deep legacies, trauma and healing." "This standout ecological novel from Arizona author Sojourner features picturesque prose, a vivid western setting, and sharply drawn characters." "Notable characters carry Sojourner's powerful story of our connection to the earth. A profoundly affecting novel." "In Nell Walker, Mary Sojourner has created a character who discovers--in her own desperate way--the simple beauty in the interconnectedness of the natural world and the complexities we heap upon it. Written with passion and humor, 29 takes the reader on a journey of hope, humanity, and love." "29 is at the intersection of a local road to Nowhere and an interstate to Everywhere. Certainly Mary's prose and storytelling is crystalline and lovely, a kind of geode broth, filled with light and piquancy." "A love letter to what we frequently deem unloveable, 29 is a wide-armed triumph of hope." "This is a story that will stay with the readers and, perhaps, bring them home to their own place, and the importance of fighting for what you love." "The language is sharp as a butcher's blade, the dialogue rings true and hard, and the story cuts deeply into its reader." "Sojourner's new novel, much like the desert landscapes in which it is set, will never speak to those who see the Mojave as an annoying blur between L.A. and Vegas, but those adventurous enough (or lost enough) to wander off I-15 will find a world bursting with fragile beauty, tenacious life, and rock hard truth." Mary Sojourner is the author of two novels, Sisters of the Dream and Going Through Ghosts; the short story collection, Delicate; an essay collection, Bonelight: Ruin and Grace in the New Southwest; and memoirs, Solace: Rituals of Loss and Desire and She Bets Her Life. She is an intermittent NPR commentator and the author of many essays, columns and op-eds for High Country News, Writers on the Range and other publications. A graduate of the University of Rochester, Sojourner teaches writing in private circles, one-on-one, at colleges and universities, writing conferences and book festivals. She believes in both the limitations and possibilities of healing through writing--the most powerful tool she has found for doing what is necessary to mend. She lives in Flagstaff, Arizona.